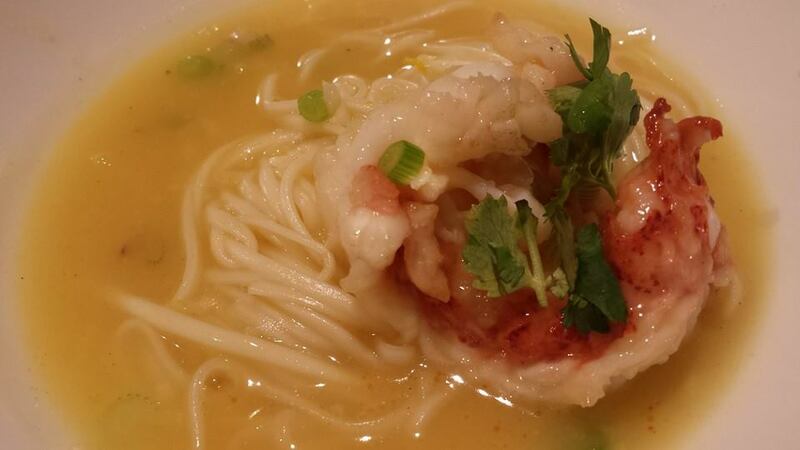 wife actually said it was better than tunglok’s lobster ramen – 龙虾焖拉面 (above photo). & the dry wok king prawns better than lobster. i think so also – almost there. sauce was very tasty with no sugar added. i was very impressed with tunglok’s lobster ramen – 龙虾焖拉面 actually…the 黄焖 golden bisque was always very tasty, smooth & flavourful. it was very similar to & tasty like a good crab roe sharkskin soup. lobster was very good too. for purpose of recreating a dish, lobster is lobster, steamed, grilled or pan-grilled it is not hard to reproduce, so mainly it’s about how to recreate the 黄焖 slight starchy golden bisque. my first attempt used small grass prawns & vegetable stock (above 2 photos), whatever was readily available. i had slightly too much starch. i added fish sauce as i thought light soy sauce & oyster sauce might darken the golden colour of sauce. anyway the sauce was tasty & my daughter liked it, but i could taste the starch – a negative point. last evening i used the king prawns my wife bought from chinatown. these were very large prawns – 7 prawns/kg so like 140g per prawn. i fried cut chilli padi, ginger strips, & garlic in butter on high heat & added the king prawns & did the dry wok prawn method. 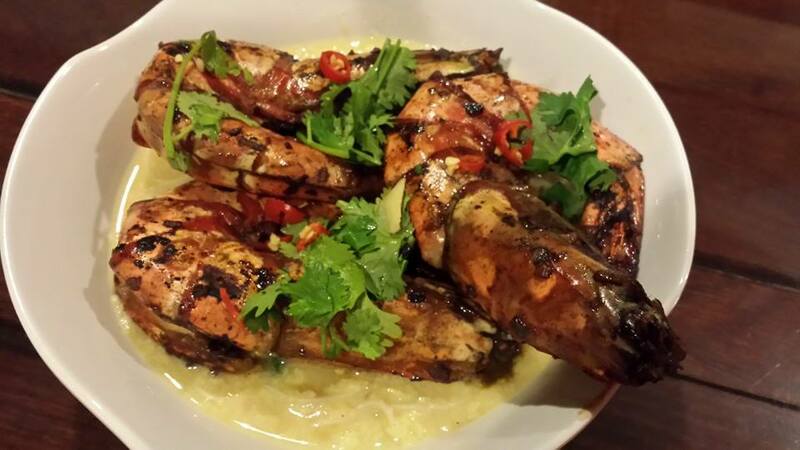 it turned out beautifully, with perfect char-grilled flavours & texture. 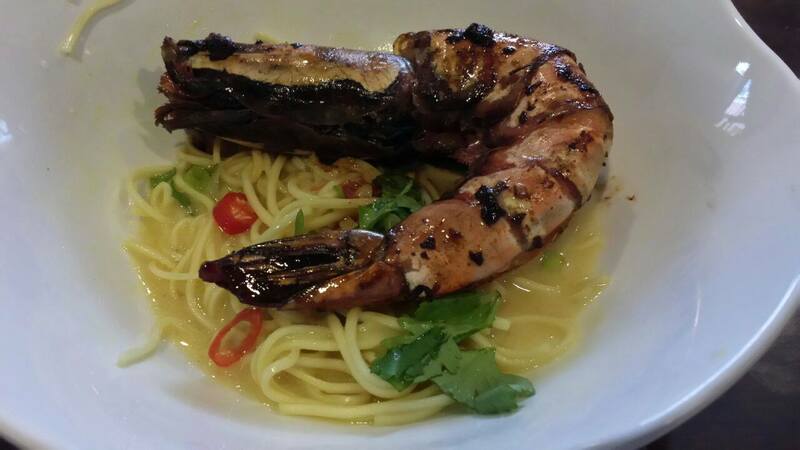 it is true that sometimes giant prawns taste even better than lobster. & they cost a lot less when comparing meat to shell ratio. 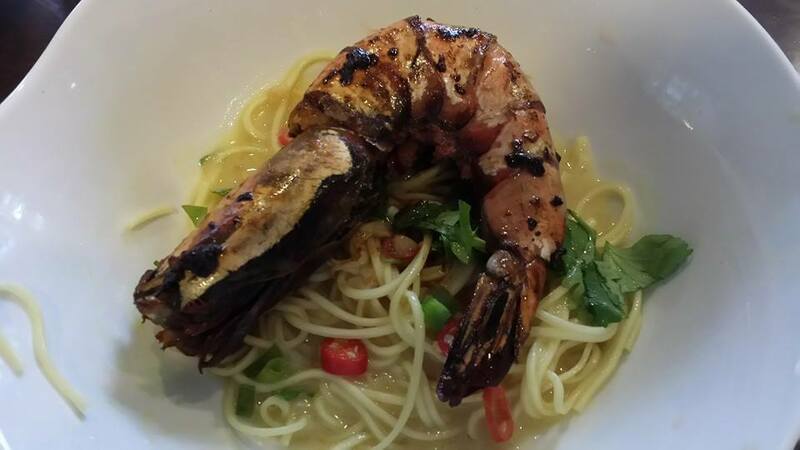 cooke prawn – season de-veined prawns (keep in shell) with fish sauce & white pepper. fry cut chilli padi, ginger strips, & garlic in butter on high heat. 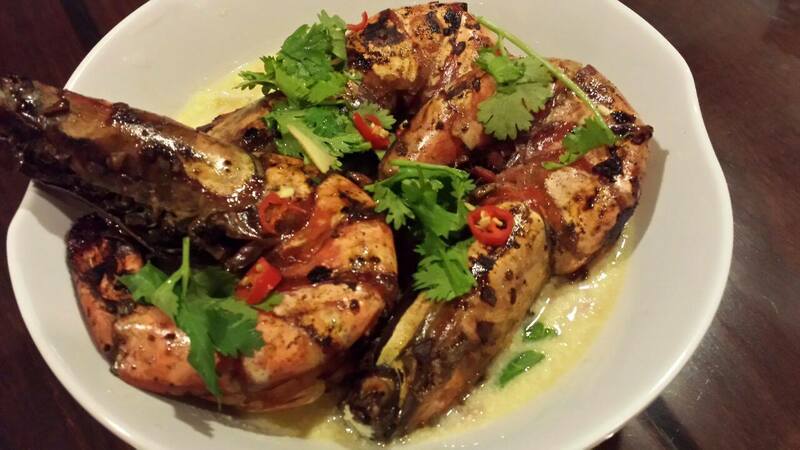 add king prawns & chargrilled using the dry wok prawn method to get perfect char-grilled flavours & texture. set aside the cooked prawns. 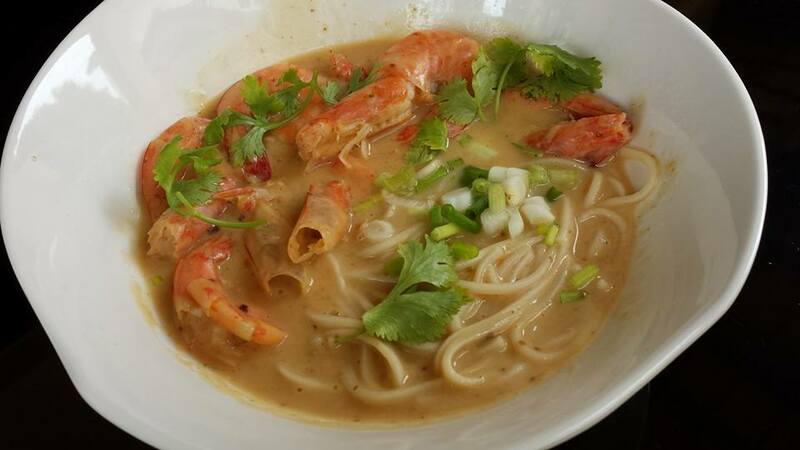 make sauce – add 1 egg yoke, mirin, sake, chicken stock, fish sauce, oyster sauce, cornflour in a mixing bowl & mix thoroughly. fry cut chilli padi, ginger strips, & garlic in olive oil. add the mixture on low fire to boiling. taste the bisque & add salt to taste. cooke noodles – cook noodles (i used white jade 白玉 noodles which had a bit of ramen texture)to just below al dente & pour into a sieve or colander & add ice & cold water to stop the cooking. now put together the dish! This entry was posted in Buon Appetito! 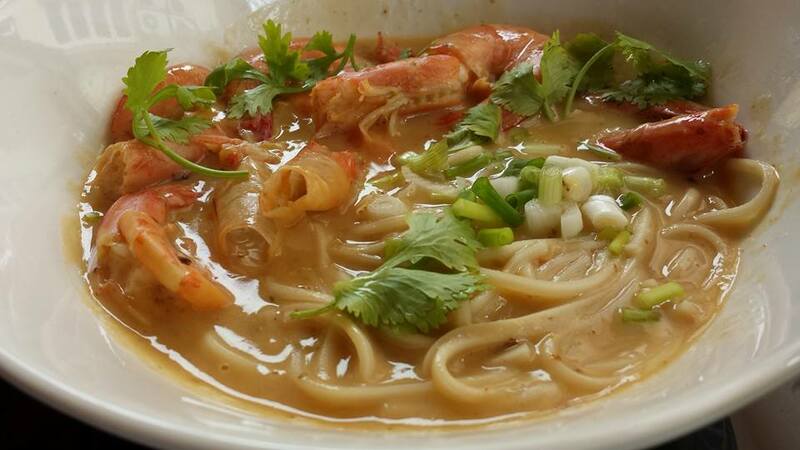 and tagged 黄焖草虾面, golden braising sauce, golden sauce, grass prawns, lobster ramen, prawn ramen, tunglok signature, 姜葱龙虾焖拉面. Bookmark the permalink.